Writing excellent Pharmacy Technician Cover Letters can give you a big advantage when you're applying for jobs. Employers often have to look through dozens of resumes for an open position. They simply don't have the time to interview everyone who applies. A well-written cover letter can help ensure you get called back for an interview and give you the opportunity to land the position you applied for. When writing a cover letter, always keep it to a single page. The cover letter is your chance to really grab the attention of the person in charge of hiring and make them take a close look at your resume. At the top of the page, put your address and the date, then skip down 3-4 lines and place the employer information. It's really important to find out who will be hiring and interviewing for this position and address the letter to them. To whom it may concern is acceptable as a last resort, but the whole idea of a cover letter is to show them how well you understand their company. If you don't do the basic research needed to use their name, then you're already one step behind anyone who addressed it to them specifically. The body of your cover letter will be three or four paragraphs. Try to write in a formal, polite tone. Avoid writing conversationally, this letter is your first professional contact with them. The first paragraph is going to cover the position you're applying for. If you were referred specifically to them by a mutual acquaintance, include that here also. Keep this very short and to the point. The second paragraph is where you explain why you're a good fit for this position, with this company. The key here is to think about what they want and then explain how you provide that. Most people write a cover letter to explain how wonderful they are, but that's only half of it. You need to put yourself in the position of the person hiring for this Pharmacy Technician job and then explain how you'll help them out. Use specific examples of your experiences to convince them why you're the best candidate. If the position is at a 24 hour pharmacy, you could explain how you've worked non-traditional shifts before and had excellent attendance. If the second paragraph runs more than five or so sentences, break it into two paragraphs. If not, proceed to your final paragraph (the conclusion). The conclusion is going to refer them to your enclosed resume, ask for an interview, and include a plan for contacting them. Always plan to follow up after sending a resume, usually with a phone call a week or two after sending it. Now that we've covered the basic format for the cover letter, here are a few specific tips to help make your cover letter stand out. First, consider that your cover letter and resume are going to end up in a stack of resumes that all look very similar. Investing in a nice, heavyweight paper to print your cover letter and resume on has an immediate positive impact. Most people will use regular copy paper, so you should use a more upscale, textured paper. 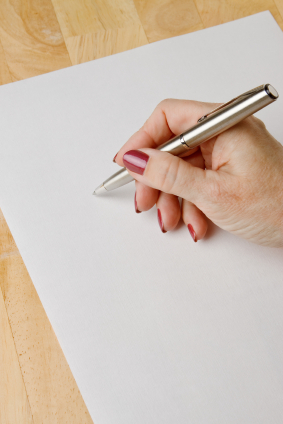 Always sign your cover letter with a pen (blue or black ink). As mentioned above, always address your cover letter directly to an individual. If you don't know who will be interviewing for the position you're applying for, call and ask. A simple phone call lets you confirm information that may not be accurate from another source, such as a website. Think of your cover letter as a sales letter. The product you're selling is you. Like all good sales letters, you need to solve a problem that your customer is having. In this case, they need to fill a position. Doing some simple research can help you determine why they have an opening, and help you sell yourself as the best fit for it. If they're expanding, make sure to mention how you're a good fit for a growing company. If they've had to fire someone for being unreliable, you sell yourself as being dependable and providing peace of mind to them. If their employees keep getting hired away somewhere else, you emphasize loyalty and list how you've had previous long-term employment. By putting yourself into the mind of the person who is hiring, you can position yourself as the exact right choice to fix their specific problem. I hope this has explained what you need to know and how to write a cover letter that will help you get hired as a Pharmacy Technician. The last thing to remember is that 90% of resumes and cover letters look and read almost identically. The most reliable way to get called back for an interview is to ensure that your cover letter makes you stand out from the crowd.